May 30, 2017 – While serving in Kandahar, Afghanistan, U.S. Navy construction mechanic Matthew Sallas may not have imagined where his experience would take him next. But researchers at Oak Ridge National Laboratory certainly had the future in mind as they were creating programs to train men and women like him for tomorrow’s maker workforce. Matt had returned to Knoxville from a tour of duty in 2013 and was working as an installer in the home remodeling business, but he was looking for an opportunity to parlay his natural inquisitiveness and mechanical skills into something more. When he heard about a special six-week internship at the Department of Energy’s Manufacturing Demonstration Facility at ORNL, he took a chance. Matt was among more than 120 applicants to the Energy Efficiency and Renewable Energy Advanced Manufacturing Workforce Development Program for returning veterans and wounded warriors. He and 14 others chosen for the program received an accelerated, hands-on introduction to the field of advanced manufacturing, including the opportunity to design and print objects in 3D. Matt’s skills as a mechanic served him well in the internship. 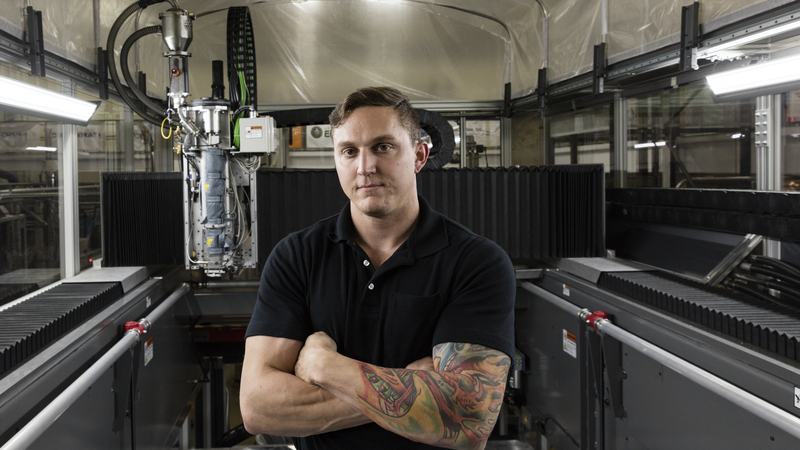 Today, Matt operates and maintains the biggest 3D printers as a staff technician at the MDF, the two Big Area Additive Manufacturing machines, as well as a large-scale milling machine that trims excess material from printed parts. Since his time as an intern, Matt has been involved in some of the most high-profile prints at the MDF, including the Shelby Cobra sports car, the house for the Additive Manufacturing + Integrated Energy project, and the mold for a new Boeing airplane wing, which earned a Guinness World Records title for largest 3D-printed solid object. His favorite project was printing a replica of a 1952 Willys Jeep, which took only three weeks from printing to assembly. Working at the MDF has given Matt a solid foundation in advanced manufacturing. He has gained skills in CAD design, programming, mechanical and electrical engineering, and heavy equipment operation. Matt’s work on the BAAM printer, in fact, resulted in his being a contributing author to a paper that examined the impact of temperature decay on bonding during the printing process for objects made with carbon fiber–reinforced acrylonitrile butadiene styrene thermoplastic. Matt continues to serve in the Navy Reserve, training at least one weekend a month and two full weeks each year to maintain readiness for deployment. He is close to earning his associate’s degree in engineering technology from Pellissippi State Community College and has plans to pursue a bachelor’s degree in mechanical engineering. He is also a certified first responder.